The weather looked fine so we thought we might have a few riders even though we had lost a strong contingent to the European H.O.G. rally. We met at Warr’s prior to the briefing and were pleased to note that we had 63 riders coming out for the days ride. 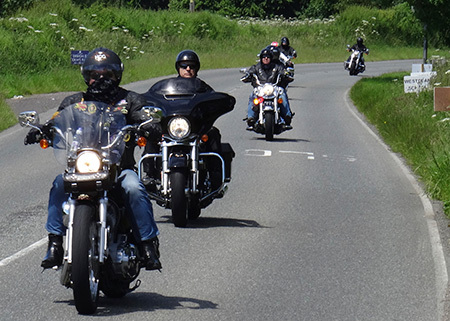 We eventually hit the back roads out of Farnham towards Odiham where the very inviting B3349 took us out through the open country side towards Alton and then down the Meon valley on the wonderful A32 for our coffee and comfort break at the great Loomies biker Cafe. It was quite impressive to have 63 bikes lined up in the lay-by on such a nice sunny day. Fueled up and ready to go we headed off on the A272 through the outskirts of Petersfield and up on to the South downs via South Harting towards Goodwood, where the topography runs into long curves and great straights which eventually drop off towards East Lavant. Through a few narrow country lanes and we were heading back up towards Goodwood Race course, across the South downs towards the A285, whilst taking in the stunning views across West Sussex towards the coast. Dropping back off the North side of the downs we headed back to Petworth, with a last minute dash along the A272 to a favored watering hole The Cricketers Arms in Wisborough Green. All riders made it and thank must go to Andy and Les for their roving marshall duties and to Colin for carrying out the Last Man duties.